Project leader David Gregory will receive the award on behalf of the consortium on the 24 May at the historic Zarzuela Theatre in Madrid. In April 2015, The SASMAP Consortium hosted a seminar and workshop, presenting and demonstrating equipment and tools developed within the project. The SASMAP Consortium is hosting a Seminar and Workshop (PDF) on the 22nd and 23rd of April 2015 at the Viking Ship Museum in Roskilde, Denmark. The seminar on the 22nd of April will be a day long series of presentations of the various elements of the project. The workshop on the 23rd will give participants the opportunity to see the tools and techniques that have been developed within the project and speak with the partners. Sign up here. 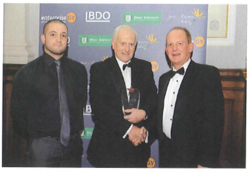 SASMAP partner, SSCS, was this year’s winners of the Great New Business Idea Award. Based on the experiences in Denmark, Italy and The Netherlands, SSCS have developed some new mats. Each mat had a variety of frond lengths and density. Besides the new mats, SSCS also made some changes to the deployment frame. First of all the new frame is a little bit wider, so when a mat is being deployed, it is automatically positioned correctly. Also the frame has extra fastenings for the mat in the middle, so when its lifted the mat doesn’t hang as low as with the previous frame. Partners from the SASMAP consortium has presented some of the work from the project at different conferences and workshops. Partners, George Papatheodorou, Maria Geraga (UPAT), David Gregory (NM) and Barbara Davidde (ISCR) all gave talks at the Euromed Conference in Cyprus November 2014. Barbara Davidde won a price for best paper. The National Museum have been present at International ICOM-CC, Council of Museums Triennial meeting in Melbourne in September 2014 and at the International Council of Museums Waterlogged Organic Archaeological Materials in Fremantle, Australia. 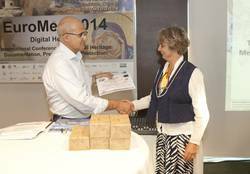 Besides being present at Euromed in Cypres UPAT presented a talk at the 18th ICOMOS Meeting. The Viking Ship museum has given a talk at IKUWA V and at SPLASCH COS the latter GEUS also gave a talk at. Innomar has presented their equipment developed within the project at different international exhibitions and workshops. 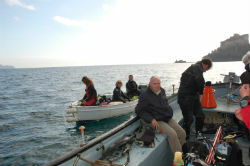 SASMAP started in September 2012 to develop new technologies and best practices in order to locate, assess and manage Europe’s underwater cultural heritage in a more effective way than is possible today. 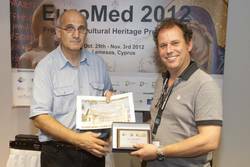 David Gregory presented an overview of SASMAP on behalf of the consortium at the recent EuroMed 2012 conference on cultural heritage projects within Europe. The conference was held in Cyprus between the 29th of October and 3rd November with 400 delegates and over 200 presentations. The presentation can be downloaded here and the full conference proceedings can be obtained from Springer. Following the successful application and contract negotiations with the EC, SASMAP started on September 1st 2012. 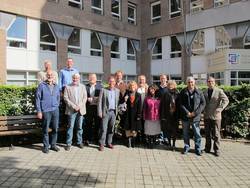 The projects kick off meeting was held in Brussels, at the request of the Commission, on the 27th and 28th of September. The two day meeting finally brought the partners together to meet face to face and start planning the logistics of the first phases of research.